With the creative characters and silly stories, Dr. Seuss books are popular with beginning readers. But Dr. Seuss isn’t just for preschoolers and kindergartners. 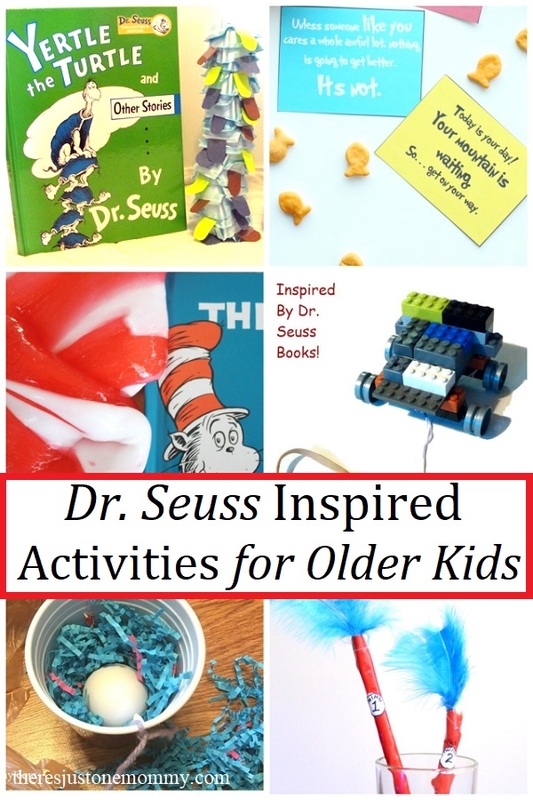 With so many fun books, there are plenty of Dr. Seuss books and activities for kids of all ages..
Below are some of our favorite Dr. Seuss activities for older kids. When my kids were in preschool and kindergarten we had lots of fun with In a People House and making a simple paper plate Cat in the Hat. Picture books are perfect for older kids, too. Not only are they fun to read, but you can use the stories to discuss rhyming and sentence structure, as well as elements of fiction like characters, plot, and theme (moral of the story). Thing 1 & Thing 2 pencils — These cute pencils are fun to craft and may even inspire your child to write their own creative stories. STEM Activity for Horton Hatches the Egg — A classic STEM challenge pairs perfectly with the book for a fun Dr. Seuss activity for older students and young ones as well. If I Ran the Zoo activity — This activity will encourage kids to stretch their imaginations as well as work on rhyming skills. Host Your Own Wacky Wednesday — No matter what age they are, kids love having a zany day inspired by Dr. Seuss’s Wacky Wednesday. Oh, the Thinks You Can Think printable activity — This is an activity with cute rhyming questions that your child can answer on their own, or you can interview them yourself. I love the idea of doing it each year to watch their answers change as they get older. Cardboard Tube Lorax — Even the Lorax himself would love this recycled craft. Dr. Seuss-Inspired Sight Word Game — This DIY game is perfect for working on sight words. You could also modify it to work on math facts. Cat in the Hat balance activity — In the book, one of the cat’s first tricks is a zany balancing trick. Kids will have fun learning about the center of gravity and trying their own silly balancing acts. Make the Cat’s Hat— That red and white striped hat is symbolic of Dr. Seuss. Follow these simple directions to make your own wearable hat just like the cat’s. Green Eggs & Ham inspired Lego sling-shot car — In the book Sam invites the main character to eat green eggs and ham in a car. Challenge your child to create their own crazy car in this Seuss-inspired STEM activity. Lorax Math Game — This cute printable math game is a fun way to work on addition and subtraction facts. Cat in the Hat slime — Kids love slime, and this one is perfect to go with The Cat in the Hat. The Butter Battle Book discussion questions — Introduce the concept of propaganda with one of Dr. Seuss’s lesser-known books. Yertle the Turtle math game — Work on addition facts with this DIY game to go with the book. You could also use the game to work on subtraction or multiplication facts. Dr. Seuss Printable Lunch Notes — Celebrate Dr. Seuss’s birthday (and Read Across America Day) with a few of these printable famous books quotes, perfect for tucking into a lunchbox. Ultimate Planning Guide for The Lorax — From writing prompts, and math activities, to building your own “Truffula Tree Cutters,” this is the ultimate list of activities for The Lorax. Activities to go with The Sneetches — The Sneetches is great for discussing prejudice with kids of all ages. These printable activities are perfect for working on sight words and math skills. 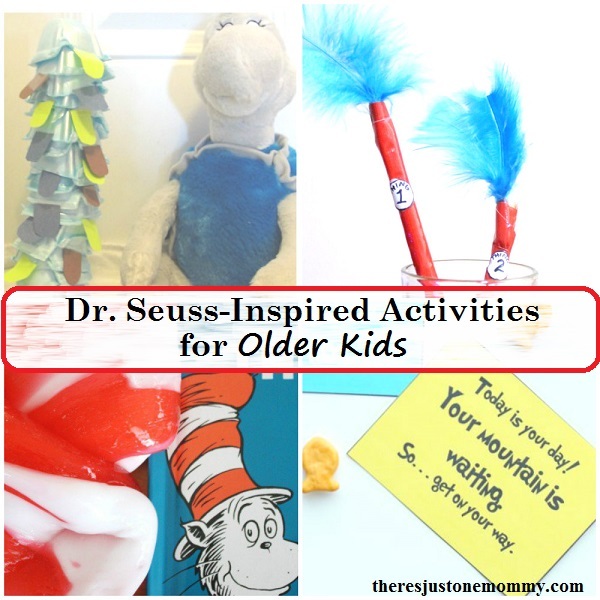 Celebrate Read Across America, and Dr. Seuss’s birthday with a few fun book crafts. 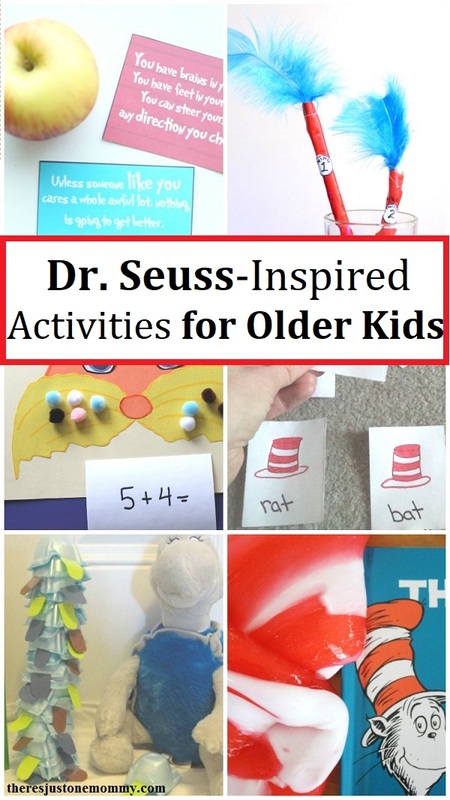 These Dr. Seuss activities for older kids are perfect for those that are past Hop on Pop and Mr. Brown Can Moo, Can You. These ideas look like so much fun! My kids loved Dr. Seuss when they were little, but I never thought of extending the fun as they got older. 🙂 Thank you for linking up with us on the Hop at Hip Homeschool Moms! This will be one of our featured favorite articles on this week’s Hop! Thank you for featuring it this week.